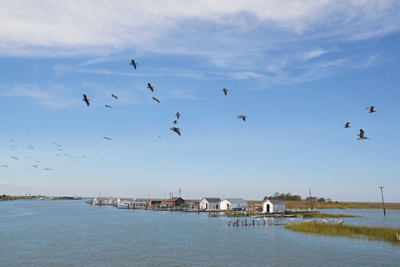 In 2015, National Geographic magazine identified Tangier Island, Virginia, as one of its twenty must-see places in the world. The tiny island shared the list with exotic destinations, such as Okavango Delta in Botswana and Eastern Bhutan in the Himalayas. Reading the article, I was surprised I’d overlooked an adventure so close by. 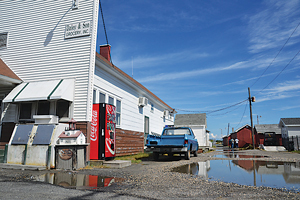 Located less than two hours from Richmond in the middle of the Chesapeake Bay, the town of Tangier on Tangier Island has long been known for its blue crab, but recently it has gained attention because it is projected to be among the first North American locations lost to climate change. 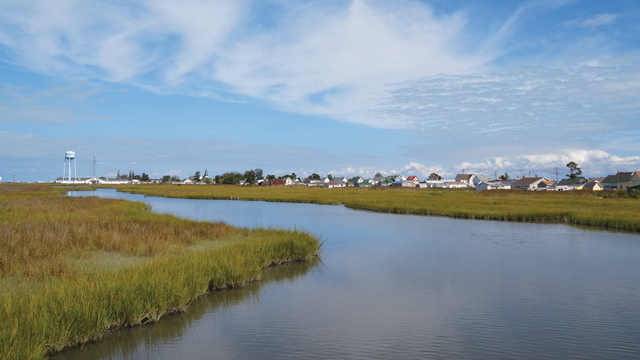 Tangier Island is the only inhabited island on Virginia’s coast that’s not connected to the mainland by a bridge. 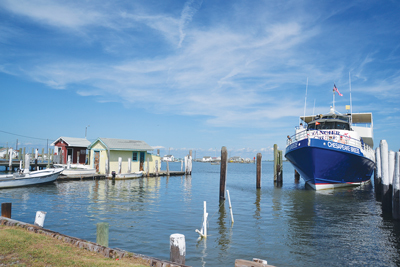 The closest ferry departs Reedville, Virginia, daily, May through October. Marsh comprises over two-thirds of the 5-mile island, so it was recommended we avoid peak summer months when mosquitoes are a nuisance. I penciled the trip onto the family calendar six times before the weather cooperated. Then, finally, one Saturday morning in late September, my teenage daughters and I traveled to the coast. The drive to the Northern Neck is picturesque. As we passed fog-covered farm stands, the remoteness of our destination began to sink in. It’s eighteen miles by boat from Buzzard’s Point Marina in Reedville to Tangier Island, and the Chesapeake Breeze took an hour and thirty minutes to travel the distance. Since it was a gorgeous day to be on the Chesapeake Bay, we selected a bench on the bow. Sunny and seventy, our patience had paid off. Tangier Island came into view about halfway through the trip. Like a hazy mirage, the land mass was so small initially that I doubted it could be our destination. Water penetrated the island in different places along the horizon so it looked like a puzzle with missing pieces. Eventually, the Tangier Island water tower became identifiable. As we approached the harbor, the captain of the Breeze pointed out the breaking wall of carefully arranged oversized rocks along the western rim. He explained how Tangier residents hope a similar barrier can be placed on the eastern side of the island to prevent further erosion. This comment and the mention of erosion prompted some teenagers on a field trip to begin discussing climate change. I was pleased to hear them recount the complex factors impacting this endangered environment. 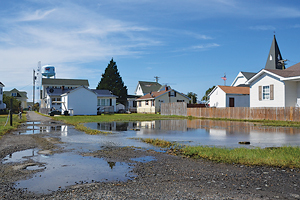 With Tangier Island sitting only a few feet above the water, the reality is a barrier wall is no match for the rising sea level. The harbor boasted a miniature floating city of free-standing docks peppered with weathered wooden sheds and stacks of crab pots. 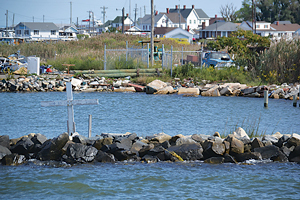 Motorized boats crisscrossed the channel between a few soft-shell crab shedding facilities. Dangling electrical wires connected the crab shacks, the way strings linked the plastic cups I used when playing telephone as a child. Gulls rested on wood pilings, where planks had already collapsed into the sea and lines of posts were the only evidence of previous walking paths. This means when a seasonal ferry like ours from Virginia docks next to the year-round cruise boat from Maryland, the Steven Thomas, the island’s population nearly doubles when all the passengers debark. We followed the rusted chain-link fence past the welcome sign, declaring Tangier residents the “farmers of the Chesapeake.” Local women waited there with their golf carts. Interested visitors can enjoy a 20-minute tour of the island for the cost of $5 per person. I’d been reading Chesapeake Requiem: A Year with the Watermen of the Vanishing Tangier Island by Earl Swift, so I knew about the residents’ distinct dialect and wanted to hear it first-hand, so we jumped in a golf cart. Born and raised in Tangier, our guide, Sylvia, spoke with the remnants of an accent inherited from British ancestors and preserved by the island’s isolation. She explained how John Smith visited in 1608 and how it’s believed the island was named after Native American pottery, called tangle, found in the area. Sylvia also shared how, according to legend, in 1686, John Crockett and his sons’ families settled on the island, purchasing it for two overcoats from the Pocomoke Indians, who spent their summer on the island. 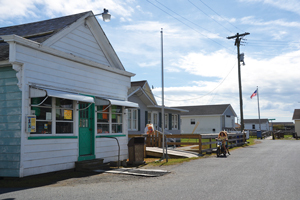 Since less than one square mile of island is livable, houses are close together. In many cases, homes are only separated by walkways large enough to hold fuel tanks. Car traffic is limited to only a handful of vehicles, so people often navigate the tight spaces on scooters. Sylvia explained the logistics of a life lived in isolation. A boat with mail from Maryland, thirteen miles across the Chesapeake Bay, arrives weekdays at 1:15 p.m. Each family must go to the post office to pick it up. A nurse practitioner resides on the island, working out of the David B. Nichols Health Center, and a doctor visits the island one day a week. In the event of a medical emergency, there’s a helicopter on call in Maryland, which can be there in twenty minutes. We crossed the marsh on a small wooden bridge – big enough for one golf cart – to the West Ridge. From this vantage point, the tall grasses blocked from view all but the rooftops on the Main Ridge. Water has always divided the island from Main Ridge to Hog Ridge, but by 2019, most of the West Ridge is covered by the Chesapeake Bay. 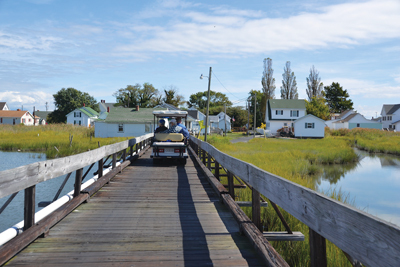 From the golf cart, Sylvia pointed out the island’s school on the north end of the marsh. The large, single-story white building, next to the water tower, accommodates all grades, including fifty-five students and their fourteen teachers. In 2018, there were six graduates. Sylvia explained nearly the entire island attended the ceremony because, in a community this small, it feels like everyone has had a hand in raising the young people. Since I am a teacher, I would have liked to get a better look at the facility, but the School Road bridge was closed because its integrity had been compromised. I struggled to imagine how unsettling it must be to live someplace that’s crumbling into the sea, like a sand castle into the surf. When our tour ended just before noon, we decided to catch an early lunch at the Fisherman’s Corner Restaurant. An exterior sign advertised how it had been featured in Southern Living magazine. With only two sit-down restaurants near the dock open this time of year, there was a bit of a wait, but the crab cakes were definitely worth it. I’ll admit when my plate arrived at our table, without any fixings I had my doubts, but the crab was so fresh and the sandwich so moist that I decided lettuce and tomato would have just been a distraction. Afterwards, we walked south on Main Ridge towards the Tangier History Museum and Interpretive Cultural Center. For only $3, visitors can enjoy a video and view artifacts, as well as a 5-tier model of Tangier Island’s decreasing size. On the street outside, my older daughter stopped to photograph a reverse water osmosis tank, having learned about the salt-water filtration system that converts seawater to drinking water. Then, we continued on our self-guided walking history tour along the road. Pictorial displays detail hundreds of places relevant to the island life, such as the Double Six Sandwich Shop, where watermen meet at three in the morning before heading off to work on the Chesapeake. While we wandered around, my children and I discussed an uneasiness that hangs in the sea air. Having run out of land, family members are buried in yards and their gravesites are covered with concrete lids to prevent caskets from floating away during floods. Water filled the streets, forcing us to take circuitous routes, and fences surrounded yards to prevent pets and children from the threat of drowning. The islanders’ harsh reality was a lot to take in, but I am so glad we made the trip. Originally, we wondered how we would spend the two and a half hours on such a tiny piece of land, but our time on Tangier Island passed quickly. My daughters meandered through the gift shops and lingered at the ice cream stand. We never made it to the beach, but that hadn’t been our intent. This trip was about bearing witness to an endangered lifestyle. When my 12-year-old remarked, “We did this to ourselves,” I took solace in her use of the pronoun we. At a young age, she recognizes that the catastrophes caused by climate change are our problem – not just theirs. This acknowledgement is the first step in saving us all.